"Italian Food Menus: Bruschetta Appetizers", forms part of the Italian Restaurant Menus collection from wonderful restaurants in breathtakingly beautiful and undiscovered Maremma in Italy. 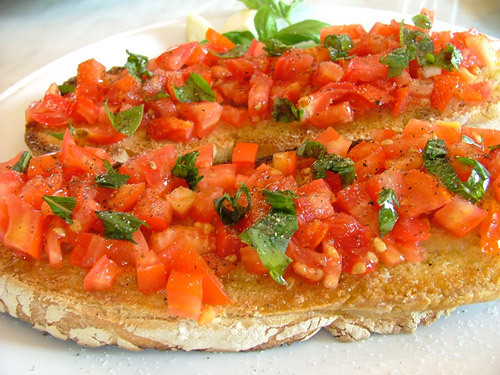 "Bruschette" is the plural for "bruschetta", pronounced "brus'ketta" in Italian. Also known as "fettunta" in Tuscany, especially in "Fiorentino" the dialect particular to Firenze (Florence), where my partner was born. Toast a slice of "pane rustico" - country-style bread and while it is still "calda" (hot) and croccante (crisp), rub a "spicchio" (clove) of garlic across the surface. Then drizzle extra virgin olive oil over it and sprinkle pepper and salt to taste. Don't skimp on the olive oil and only use the best quality. And there you have a bruschetta appetizer at its simplest. This first menu is from the Palmieri Ristorante Pizzeria Lanternina 2 in Pratoranieri, Follonica and forms part of their Italian dinner menu. This Restaurants Follonica page is where you can read my review of the La Lanternina 2 Palmieri Ristorante restaurant: it is one of my favourites in Follonica. This second menu extract is from my very favourite Maremma Restaurant: Ristorante "Il Leccio", in the tiny hamlet of Cura Nuova, near Massa Marittima. To read about "Ristorante Il Leccio" and browse the whole restaurant menu, click on this Restaurant Maremma link.